Being a keen road cyclist I experienced my fair share of leg cramps in the last stages of my cycle races. Kinesiology taping is my most recent and probably the most effective tool, amongst others, I have started using to combat leg cramps and get me to the finish line pain free. I have participated for the past 4 years in long road cycling competitions. These grueling endurance races are in excess of 100km, with the average cyclist taking between 4-5 hours to cross over the finish line. Year after year I was dogged by cramping in my quads, the large powerful set of muscles that span the front of the thigh from the hips to the knees. As many cyclists will have experienced, the moment when your quads spasms and you unable to push the pedals is hugely demoralizing and frustrating. This was typically happening to me after 4 hours but it was preceded by twitches in the muscles giving me warning signs not to push any harder. Exercise Associated Muscle Cramps (EAMC) is still a very real issue for me and has prevented me from achieving my sub 4 hour goal. While over the years I have learnt to train with intensity and simulate race conditions, drink sufficiently water, eat carbs, pop electrolyte pills and set up my bike, I still experience leg cramps towards the end of the race or the very last hill. I have set about to find something else to give me that extra boost to get me to the finish line pain free. My answer has been Kinesiology taping my quads. Kinesiology tape is the generic, non-branded term for elastic medical adhesive tape used for support and pain relief in muscles, joints and tendons. The tape is thin and made of woven elasticated cotton and nylon fibers, which can stretch up to 140% of its original length. The cotton fibers allow the tape to dry quickly allowing the tape to be worn for up to 4 days. The backing is a medication free hypoallergenic acrylic adhesive which is heat activated. Suppliers market it in pre-cut patterns or rolls for easy application to prevent or treat hundreds of common muscle and joint related injuries. Kinesiology taping is applied before, during or after activity to provide pain relief and support. 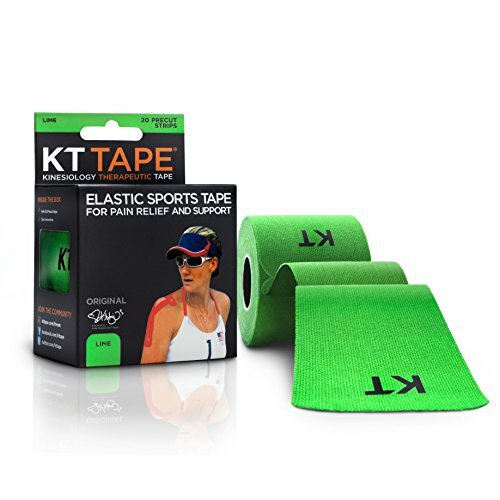 KT Tape is a leading brand of Kinesiology Tape and the first brand to ever be offered directly to consumers. It is widely adopted by healthcare professionals and sports teams and recently growing popular in response to being correctly applied with positive clinical results. The product is available in up to seven colors: Black, Blue, Beige, Pink, Red, Green and Orange. How Does Kinesiology Taping Work? Muscles and joints will eventually become inflamed and swollen when overused. The inflammation and swelling is due to accumulation of blood (internal bleeding) and lymphatic fluids. The excess fluids and blood create a pressure in the area which is painful. The body should remove the excess fluids via the lymphatic vessels in the area however if the inflammation is great enough, the lymphatic vessels become compressed by the skin and are unable to drain the fluids effectively and relieve the pressure. This reduced ability can lead to ongoing cycle of inflammation and pain, slow healing and recovery and limited performance. When the muscle tape is applied to the skin in the inflamed area, the tape stretch pulls and lifts the skin away from the muscle, increasing the space below it. With the increase in the interstitial space created between the skin and the inflamed tissue, the blood flow is improved and lymphatic vessels function properly. The pressure is relieved in the inflamed or swollen area, decreasing activation of pain receptors and giving pain relief. The improved blood flow resulting from the kinesiology taping enhances oxygen and nutrient delivery to the affected muscle or joint and promotes accelerated healing. Pain Relief – Due to the tape lifting the skin away from the muscles, the lymphatic fluid and blood flow improve, reducing inflammation and pressure. The less pressure experienced decreases the activation of pain receptors. Prevents and/or Relieves Spasms and Cramping – The main use for myself. The reduced inflammation and the better blood circulation through the muscles and draining of lymphatic fluids helps prevent or relieve spasms and cramps in overused or injured muscles. Faster Recovery of Overused Muscles – This is a very noticeable benefit which I experienced a day later. Without having my quads taped my leg muscles felt sore for 4-5 days. Applying tape to my legs the recovery is accelerated hugely. The reason for this is that fatigued, overused muscles are saturated in by-products such as lactic acid which limits the ability to continue using the muscle. The kinesiology tape applied to the area helps remove these by-products and gives a more rapid recovery. The quicker I recover, the sooner I can begin my next training session. The best time to apply the tape is more than an hour before you exercise. You want to press it down hard and rub it to create some friction heat. Always apply the tape to clean skin that is dry. If you are sweating the tape will not stick. Also do not try applying tape outside on a hot humid day just before you exercise, it will not stick. It is preferable to apply the tape in a cool dry place. The area where you want to apply the tape must be free of lotions, moisturizers and sunscreens as the oils interfere with the adhesive. I have heard some people have used a hair dryer to heat the applied tape up to get it to stick better. This method will also save you some time if you needed to exercise within the hour. In the more extreme situations, like water sports where the tape is likely to not last so long, people have applied some extra strength hair spray. The hair spray is sprayed on the area and left for a few sends to become tacky. The tape is then applied and found to stick even stronger.